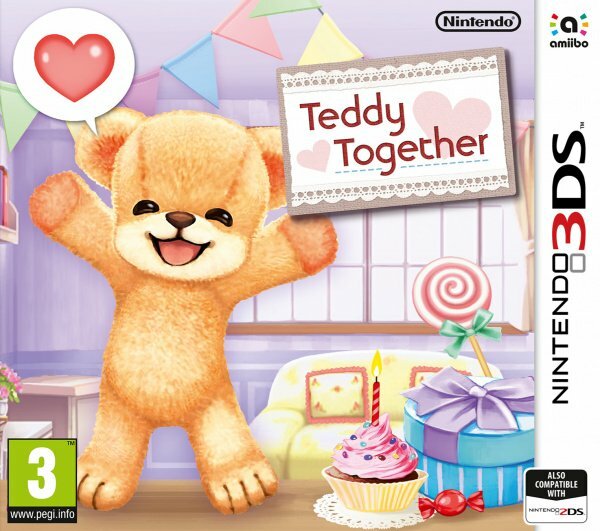 Teddy Together, to be clear from the start, is a game aimed at children. Mashing together aspects of Miitomo, Nintendogs and even Cooking Mama, it goes without saying that this title won't appeal to many older and experienced gamers. That said, it is a very well put together, varied and fun game which kids will definitely enjoy. Teddy Together began as 'Kuma Tomo' and was released in Japan about two years ago by Bandai Namco. 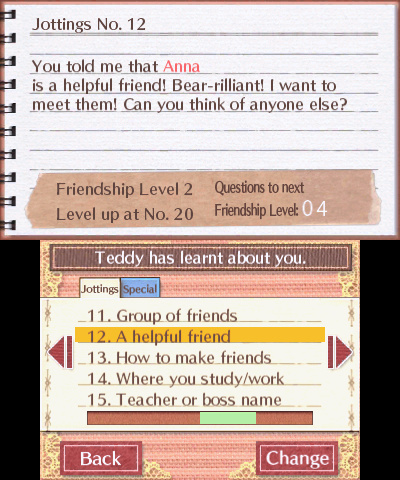 The game sees you naming a cute Teddy Bear and beginning a friendship, with the end goal being to gain trust from the bear and connect with him / her. Like Miitomo, the Teddy will sporadically ask personal questions that you answer via your microphone or touchscreen; the idea is to teach kids how to converse with others and maintain a friendship. Also, this bear can talk, a lot. He rambles on and on, and it can be a bit much after a few minutes of his incessant questions. Luckily the conversation is not all there is to the game; once you have a little connection with Teddy you can play some games with him. You can give him a bath, do some gardening, make him some food or change his clothes. This is all via the menu on the touch screen, so you click a bathroom for a bath, a kitchen for cooking and so on. 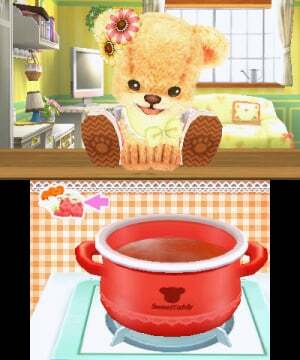 The cooking takes inspiration from Cooking Mama in that you have a recipe and make the food yourself, and as you go on more recipes become unlocked. There are also options for 'Notebooks' and 'Outside'. Notebooks allows you to see what Teddy has learned about you so far, and lets you edit the answers you have given to previous questions. You see, Teddy remembers everything about you, and once you interact more he will start to suggest things to do based on your interests. 'Outside' is, well, outside. You can visit shops to buy Teddy clothes, sweets and seeds. The gardening aspect involves taking care of flowers and completing a plant collection; like in Animal Crossing, combining certain seeds gives rare flowers. The 3DS is really used well here - the graphics aren't rushed and the environments are detailed. The touchscreen and microphone are both used too, bringing the interactivity up a notch. Some Super Mario-series amiibo are also supported, and using a specific figure will give you coins that you can use to buy things. If you don't have any amiibo, playing mini games and doing tasks will give you coins too. Use of the wardrobe is reminiscent of Miitomo or Tomodachi Life, with a vast variety of clothes for Teddy to wear. Although we have referred to the bear as a 'he' in this game, you aren't told what gender your bear is, allowing you to choose for yourself; there is a good mix of girl and boy clothing from which to choose. The main problem with this game, beyond the positives, is the voice acting. The bear sounds, frankly, a little creepy. The creators have clearly tried to go for the non-threatening approach, but it's just too softly spoken and breathless for comfort and doesn't match the cute look of Teddy. That said, his pronunciation is good, and will teach children how to say certain things. There is no online support either, so whatever is said to Teddy can't be shared with others and parents can be assured that the game is safe for young players. There's something in the design of that teddy bear that looks... kind of creepy to be honest. I think it could be the massive forehead. Thanks for the review. I'm planning to buy this my daughter for Xmas, sounds like she will get a lot out of it! BTW, will not appeal for older gamer ? I don't think so. I'm kinda interested with that game and i'm not a kid at all. Well, it beats Garfield Racing. @GeminiSaint I think it's compounded by the two scar-like lines running up from its eyes that make it look like someone's taken a pair of cleavers to the bear's gigantic cranium. But I hope the game finds its audience, and the audience isn't too creeped out by it. "Teddy Together is a pleasant little game, and is a great option for children to play with their parents." That's about the only positive I can say about this game. @SLIGEACH_EIRE Not only is your comment a poor attempt at trying to be funny, but it's also plagiarism and just plain ignorant. Of course it's for kids. Geez. As if you've even actually played it. This really needs to be a North American release as well. Waits for @Barbiegurl777 to provide us with her review. I have never seen anybody so hyped for a game as Barbiegurl777 was for this one. She showed her enthusiasm on here and on miiverse. @Jingo_Unchained It's not plagiarism. Duh, of course it's for kids. I don't need to play it. If you want to be like that, then nobody can say anything positive here because they haven't played it either. @SLIGEACH_EIRE You said it's the only positive thing YOU can say about the game. But you didn't say that. The author of the review did. You just cut out a few words and claimed the rest came from you. That's plagiarism. @InklingOrange I was thinking the exact same thing. I bought this game day one for my daughter. She played it for one day. 27 pounds down the drain. I already thinking about traded it in. Teddy Bear for Smash 5. Get on it Sakurai! "a bit off"? It sounds like a demon! @Anti-Matter Are you interested in playing with teddy bears? Literally the only reason I clicked this review. Surprised she's still not posted. Wake me up if this hits NA, I loves me some creepy teddy bears, and boy oh boy, is that thing ever one! haha it was the only reason I clicked on here as well. She is definitely raising awareness for the game I will applaud her efforts. That isn't plagiarism. That's just a quote. It even has the quotation marks and everything. Plagiarism is when you try to pass a recognizable chunk of someone else's work as your own. That clearly was not the case here. At no point did that guy attempt to make us believe those quoted words were their own. Quotes =/= plagiarism. I played the demo. I thought it was absolutely adorable and had some definite potential. Then he started talking...Sweet Arceus is his voice annoying! @Joeynator3000 I was expecting higher. The intended audience rarely get a game of this kind this well made. Do you expect NLife to rate a game low just because it's silly and juvenile? They have more tact than that. Well, not so much but at least there is some interest. The game mechanic itself (Speaking) kinda make me more interested. Because i like to make fun with something, i wanna know if the Teddy can 'speak' Indonesian words by typing some words that sounds like Indonesian accent. When i'm thinking about Teddy Bear, I'm not thinking scary Teddy Bear like usually Western people did. I'm thinking about Cute, Fluffy, Innocence and Adorable Teddy Bear, just like Teddy on Animal Crossing New Leaf. Oh...not just only Teddy Bear, also i'm interested with Ocean creatures dolls like Dolphin, Manta Ray and Xiphias. I'm different. I have some interests that maybe dismayed someone else. I like Cutie stuffs. That's why i play Animal Crossing New Leaf. Sorry for make you concern but i'm fine. I used to have almost no friends in my real life because i'm different. I don't really like to make relationship with 'any' people, depend what interest that they have. I usually play my games alone, sometimes i play with other people when i'm on Game Arcade or involved in deep conversation when i meet with someone and quickly involved into interesting conversation. 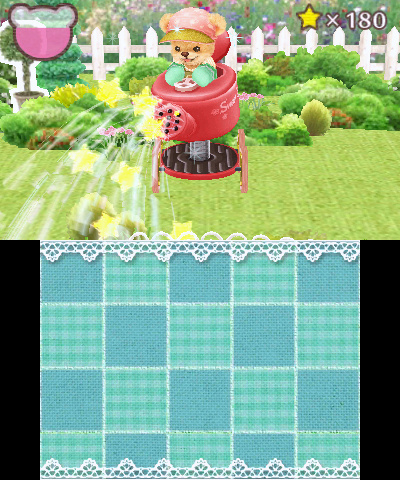 If you don't know about me yet, i like Cutie stuffs, especially like Animal Crossing New Leaf. Well, i'm also like manly sport like Boxing or Kickboxing but in Cute looking like Animal Boxing NDS. Oopps... sorry if i talk too much. I downloaded the demo of this, was scared by the text-to-speech (and the selected tone/speed), and then made him reference sweets and being 'Weed'. Good times. I agree with the score. @Ikramali A lot of adults I know who deal with matters of life and death or something else very serious every working day read/watch/play stuff for kids/teens. It's a healthy counterpoint to the stressful working hours, and lets you remain healthy emotionally. You're probably imprinting your snobbishness on your own daughter, which is why she abandoned the game. @amishpyrate I know it's not. I'm just sick and tired of this guy spreading negativity over every nook and cranny of the site. @Jingo_Unchained Now you're being pedantic. So what, if someone uses just a meme in a response that's plagiarism? And please stop lying. @Jingo_Unchained He is the site's old curmudgeon, and utterly harmless. You just might be taking him too seriously. @Barbiegurl777 Took you long enough to post here. @Mega_Yarn_Poochy At least they are consistent. @Jingo_Unchained sorry, should have stayed out of it. I don't frequent the chat section enough to put my two cents in. @amishpyrate Not your fault, mate. Maybe I should start doing the same. Especially if this site's just gonna start taking my comments down for no good reason and with no explanation as to why. @SLIGEACH_EIRE No, I am not a troll. I'm sorry if you truly think that, and I'm sorry you felt the need to start calling me names. I just want to maintain some positivity around here, you know? It hurts me when I see people so needlessly negative over everything all the time. It makes me develop negative feelings just seeing other people that way. I don't like it. Positivity is key. @Barbiegurl777 Sorry you have to import, damn NOA, but at least now you're getting it! @Jingo_Unchained Eire can be a pain at times, but he's free to comment as long as he doesn't break any rules. You started an argument over a simple harmless comment, and even resorted to name calling before he did (by calling him ignorant twice). Even though I had already asked for you two to stop. Please be more tolerant in the future, and maintain the positivity by being positive. You know, if I have a spare slot in my storage boxes for the 3DS collection, I will pop this one in. It looks interesting and a fresh change of pace from the other games in my collection. My main complaints is the voice of the bear, the non stop un-escapeable question flood from it, the repetition and sligthy too long loading screens - at least those are related to the demo. ... that it isn't available in all the languages. "That said, his pronunciation is good, and will teach children how to say certain things." The game was advertised (rather: copy-pasted and translated English description of the advert) here like you it can help your kids how to speak. Yeah, but only in like 5 languages in Europe. For the rest - the kid will have to memorise which option does what and deal with the dead-sounding foreign voice synth - not the best way to learn a language either. Not to mention how small the 3DS user base is in the unsupported countries. They are pretty much aiming at UK/Germany market, maybe France and Spain. And yet they choose to ignore the whole America? Forgive me if I'm ignorant, but wouldn't it be more profitable to make NA release, where most people speak English and French, and the other languages pretty much cover the whole society? Even if they think the game won't sell well in NA, wouldn't the profit be comparable, if not higher, than from the 5 countries in Europe, given how big NA population is? @Anti-Matter Teddy bears are not scary in the West. I still want it! Cuteness and all. @InklingOrange I don't think the game is out in the US (I don't see it at least) which would be why she hasn't responded. The demo was super boring. Excuse me ? So what if i like something cute ? That's my choice. Even i like cute, though i still like manly looking. So, take a look one of my sample gallery. You'll know what kind of my cute looking. Look, i also like something manly like Boxing or Kickboxing BUT i twist them in Cute looking, inspired by Animal Boxing NDS. I like something with Adorable & Friendly looking, Colorful and Unique. Do you mind if i'm a Gamer that ONLY play appropriate games, even kiddie games or girlie games ? @Jingo_Unchained love your outlook on life. Thank you. @Ikramali That is really rude. Also many people still say the same about gaming in general, so you may want to watch who you lump into the antisocial bin considering you are in here with the rest of us. Video games are a form of entertainment and any gamer should be allowed to enjoy what they like and not have to be taken to task for it. Grow up. @Ryu_Niiyama sorry didn't mean to offend. It must of made you upset. @Ryu_Niiyama And thank you for being one of the only commenters here to not come at me in a rude or negative way! @Barbiegurl777 Yeah you can safely import from Germany, France, Italy, etc, because they all share the same cartridge or disc, with English as an option. I do it all the time when it's cheaper. Yikes, how can a cute little game like this cause hate and vitriol?? Get a grip, people!